Senior Annuity Alert Reviews - Legit or Scam? SeniorAnnuityAlert.com Reviews – Legit or Scam? Heading into retirement can be very nerve racking. A typical concern for most retirees is the inevitable change of income. The range of options annuities provide, have made them desirable for senior citizens and for those who are entering into retirement. Senior Annuity Alert provides resources and information on annuities to educate seniors before they make any financial decisions. To access the Senior Annuity Alert website you will need to provide an email address, it is that simple. There does not appear to be any fees for its services and resources. 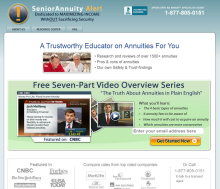 After signing up for Senior Annuity Alert, you will gain access to a number of resources including videos and e-books. Financial advisers and licensed representatives are also available to answer questions and guide you in the right direction. With so many types of annuities, it is hard to decide which one is appropriate for your individual situation. This question along with many others can be answered by one of their representatives. Living trust mills have recently been exposed for unethical practices and providing inaccurate information on annuities to senior citizens. These mills have representatives, which are actually sales agents, paid on commission. With a commission-based pay, these agents’ intentions do not include their client’s best interest, it is for their own monetary benefit. They use tactics to make senior citizens feel vulnerable to financial hardship in the future. If a sales agent finds their client already has money in an annuity or another form of security, they will persuade them to transfer it. The generation of baby boomers’ are all in the process of retiring or have already done so. With the valuable assets and considerable saving accounts they have acquired, they too are a target for these living trust mills. Is Senior Annuity Alert a Scam? Senior Annuity Alert may be a site full of resources and tools focused on annuities and financial planning. They have representatives and advisers to help answer your questions and point you in the right direction. If they themselves are sales agents or if they are steering members into the hands of other sales agents, then they could be part of the problem. Senior citizens and anyone planning for their retirement should to be cautious and aware of companies and individuals who solicit financial advice and services. Do not sign any documents without having your own appointed lawyer view the documents first. Make sure to have someone with you during any group meetings or consultations, someone who is knowledgeable about your individual financial situation and can watch out for any sleazy sales tactics. It is possible to find an annuity to fit your needs and have financial security, just don’t rush into any contractual obligations. Average Rating for " Senior Annuity Alert " is 1 out of 5 based on 1 reviews. Avoid this scam company. They have been calling me and leaving voicemail messages for six months even though I did not call them and even asked them to stop. Is this really the type of people you would trust your money with? They are immature assholes!